#AishwaryaRaiBachchan was awarded #WomanofSubstance title by the Bunt community in Pune. 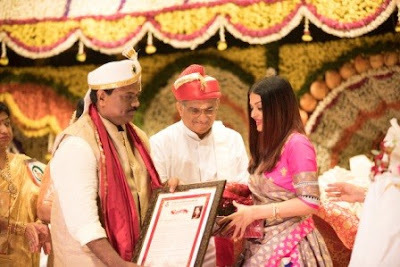 Aishwarya Rai Bachchan attended an event in Pune organized by the Bunt Community, the former beauty queen was bestowed with a Woman of Substance title and Aishwarya looked elated. After a five-year sabbatical from film acting, Rai made a comeback with Sanjay Gupta's drama-thriller Jazbaa, followed by Omung Kumar's biographical drama Sarbjit. Aishwarya Rai rocked the silver screen with Karan Johar's romantic drama Ae Dil Hai Mushkil, alongside Ranbir Kapoor and Anushka Sharma in which she played the role of a poetess named Saba. She will also play a woman suffering from dissociative identity disorder in a remake of the 1967 film Raat Aur Din.